Lots of apologies for vanishing from blogging. You know some days you just wake up and you are like oh my gosh I should put pictures up and be super productive and share my little story with my loved ones and then you sit down and two hours later all you have to show is the 100s of things you pinned on Pinterest. Well that has been the story of my life for quite a few days. Being on vacation from school has taken all of my energy out. But I am back now!!!! 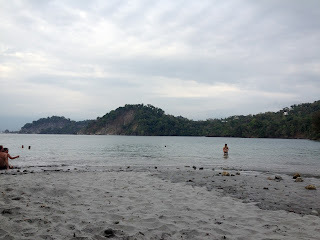 So here is the first little bit about my trip to Manuel Antonio. So a small group of us Mark, Sam, Jeni, Alyssa, Kyle (alyssa's boyfriend) and me went on a weekend trip. Courtney and her friend Alex, who was visiting from the states, met up with us on their way back from a trip to Nicaragua. Kyle was also visiting from back in DC for the weekend. So it was quite the adventure. Manuel Antonio is a national park on the Pacific side of Costa Rica. What is super neat about this park is that after walking through the rainforest portion you end up walking right into the pacific ocean. After our 3 and a half hour bus ride from San Jose we got settled in out hostel where Jeni, Mark, Sam and I had our own room. Oh yes with bunk beds!!!! The bust ride wasn't that bad, plus the snack stand that we stopped at had the best gummy sour watermelons ever!!! So good! Sad note though was the bus definitely did not have air conditioning. To say it was a bit toasty, is a bit of an understatement governor! We immediately dropped our bags at the hostel and walked down (it was really more like a trek) to find this little beach that was outside of the park and full of middle aged white haired Americans. But you know I am pretty used to hanging out with my white haired papa. This was the awesome view from our hostel. It had a really nice balcony filled with hammocks and comfy chairs. 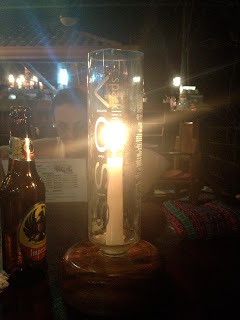 Only let down was that apparently continental breakfast means toast here in Costa Rica. Toast, it just really isn't the same as you know pancakes, fruit and bacon...BACON!!!!! Yep that is me chilling in a hammock. Well more like those are my footsies. It is interesting I never really thought of myself as a hammock person. Mainly cause it is pretty much impossible to look cute while getting out of a hammock, IMPOSSIBLE. But I have come to seriously love them. The best is if you can get someone to sit buy you and just have them give you a little push with their foot every five minutes. That my friends is called perfection!!! And yep that is the ocean in the distance. At the park we saw lots of monkeys. But I will tell you about those later and our visit to the park. I can't smush all the fun into one post, now can I? We ate at some really good restaurants while we were there. And this is my favorite use of a Voss water bottle ever. If you do not know what Voss water is please stop whatever you are doing and go ahead and pop some popcorn, grab some licorice, put your feet up and watch the amazingness called A Cinderella Story. One morning Jeni and I went out for breakfast just the two of us. And we were given these precious little pots of tea for our tea. And somehow accidentally ended up ordering ice coffee while we were paying. Luckily you know I don't mind when things get lost in translation and i end up with a yummy treat to take with me. And this my friends will probably go down as the greatest traffic sign in history. I mean there is so much to look out for creepy looking children, dogs, SLOTHS and monkeys. That is a lot!!!! 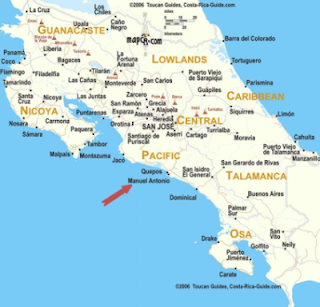 I will put up posts on our adventure in Manuel Antonio National Park and our adventures kayaking in the mangroves and going to this awesome place called Rainmaker.